"And may I say it has been a great pleasure doing business with a man as beautiful as you." When one thinks of noted director Vittorio De Sica, the picture that comes to mind is the Neo-realist classic, The Bicycle Thief. One hardly thinks of him as a director of flat-out comedy, but he proves himself more than equal to the task in this Peter Sellers vehicle, written by Neil Simon. 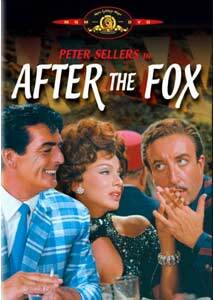 Aldo Vanucci (Sellers) is The Fox, a master criminal, presently in an Italian prison but in complete control of his situation to the point that he gives his family care packages on visiting day. When he hears that his young sister, Gina (Britt Ekland), is running wild, he contrives an escape. Aldo finds that Gina is movie-obsessed and aiming for a career in film. He decides that to make the money necessary to take proper care of his family, he needs to handle the smuggling of some gold into Italy. As his method, he seizes on vain action star Tony Powell (Victor Mature) and convinces him and a small coastal town that they are making a movie about a gold smuggling operation. Among other disguises such as a priest, a doctor and an American tourist, Vanucci assumes the role of Neorealist director Federico Fabrizi and proceeds to con everyone, including the chief of police. This turns out to be one of the funniest comedies I've seen in a very long time. Nearly everything in this picture is hilarious, with everyone (other than Ekland) demonstrating impeccable comic timing. Peter Sellers is obviously the master of such work, but I never would have dreamed Victor Mature could have been as funny as he is here, sending up his pompous image and deflating it completely. Even Martin Balsam, as his long-suffering agent Harry, has many laughter-inducing moments. The foibles of people and their willingness to believe anything when it comes to making a movie is certainly good fodder for humor, and it's played for all that it's worth here.The slapstick quotient is high, but there's also plenty of verbal comedy. Visual humor is quietly included as well, down to the "Oscar" that Mature seems to have embroidered on nearly every piece of clothing he wears. De Sica himself also has fun, playing himself as a pompous director demanding "More sand!" as he films a sandstorm, well past the point where nothing at all is visible on the screen. Also amusing are the weasel-like police who are imperturbably deadpan as they fail again and again to corner the Fox.It may be that much of what makes this movie so funny will be best recognized by film lovers. The comedy here plays on the knowledge and expectations of the film buff to a very high degree. How else to explain the amusement found in Victor Mature asking his agent in a bewildered manner, "What's Neorealism?" in a 1960s Italian movie? The adventures of Federico Fabrizi as he attempts to convincingly make a movie send up the whole Italian art film, as cockeyed angles from inept cameramen and mistaken shots are described as high art by a film critic late in the picture. Indeed, the picture plays as nothing less than an amazingly hilarious deconstruction of the mystique of cinema, perpetrated by none other than one of the greats of cinema. For this, After the Fox deserves several gold stars. The story holds up pretty well. It helps to be a little familiar with Victor Mature, but there's plenty of amusement here even if you don't know anything about him. A highly enjoyable frolic through and through. Image Transfer Review: The anamorphic widescreen picture is fairly good for its age. There are some scratches and color instabilities in the first reel, but after that the appearance improves considerably. The palette is generally subdued, but when bright colors are called for they come across beautifully for the most part. Black levels are good and detail is decent. Overall, not bad at all. The pan & scan version on the flip side is terribly cropped; central characters are constantly walking in and out of the frame and there's a dizzying quantity of movement. Only the extremely uncritical will be satisfied with this version of the picture. Thankfully, the full panoramic version is properly presented. Audio Transfer Review: The mono sound is pretty good. The dialogue is clear throughout, and Burt Bacharach's peppy Europop score (including the theme song by The Hollies, with Sellers) comes through beautifully as well. Bass is lacking, but there is no shrillness or unpleasant quality to the sound. Nor did I detect any noticeable hiss. Extras Review: The only extra is a trailer, presented in 1.85 anamorphic widescreen. It's in decent condition for its age. Thankfully, MGM has resumed putting English subtitles on its DVDs, in addition to the usual French and Spanish ones. Not much, but the essentials are here. A hilarious caper comedy, with many excellent performances and expert timing. Some picture difficulties remedy themselves after a bit, and the extras are scant, but well worth seeking out.